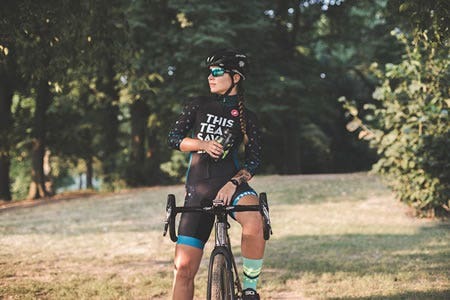 This Team Saves Lives is a group of women who live and breathe bikes, weekend adventures, and breaking the boundaries of conventional cycling by taking things off road. They are adventure seekers, artists, racers, and explorers. Their racing is driven by a cause headed up by This Bar Saves Lives to provide life saving therapeutic food aid to children suffering from severe acute malnutrition. ThisBar donates a packet of life-saving food aid for every top 10 placement achieved by a rider on the team. For 2016, their bike sponsor No.22 Bicycles, will match their donations with ThisBar to double their reach. Outside of their work with This Bar, This Team Saves Lives bands together to help their local communities by creating clothing drives, making sandwiches, hosting clinics and giving back. Joining a cause that they strongly believe in not only adds to the drive behind the goals they wish to achieve in their races, it gives their team a distinct purpose beyond racing bikes for themselves. Their hope is to make positive contributions, no matter how small, in multiple ways and places where they can. Let’s start with the heart, not the metaphoric one, the anatomic one. Using a heart rate monitor while training can tell you a lot about your body that your brain may not recognize. Heart rate monitors help you know when you’re training hard and when your body needs recovery. We plan to use our Tickr’s to keep track of our training zones. We can pair the Tickr’s with our computers while on the road or on the trainer. One of the huge and unique benefits of the Kickr trainer for us as a cyclocross team, is the ability to train on our cross bikes without needing a separate wheel that has a smooth road tire on it. It’s one less wheel that we need to have. While we train all year round, using the Kickr and the Snap indoors with Zwift makes the rainy days a little more enjoyable, especially as a team. It’s like a videogame that’s beneficial to your health! We will also be bringing some of our smart trainers to races for warm ups and cool downs. "While I train with power, it's still essential to wear a HR monitor because that is one way my coach and I can tell how my body is reacting to the efforts. Sometimes if I'm sick, stressed or overly fatigued, my HR data is a good indicator that more rest is needed. Recovery is a very important part of my training, especially since I also work a high stress full time job. Taking care of my body is paramount to reaching my goals while also maintaining a balanced and happy life!" "Partnering with Wahoo this season is a big deal for us. Wahoo gives us a whole new audience and platform to share our goals and achievements. 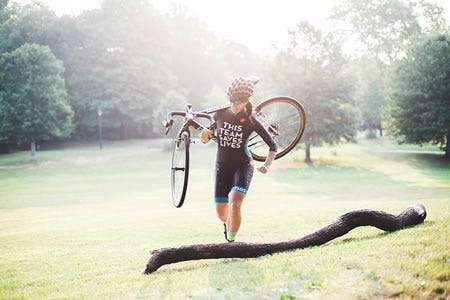 We believe in our message to help others both on and off the bike. We also want to encourage growth in women’s cycling and provide insight into training and racing for women interested in trying it out. The equipment will help us dial in our training even more and allow us to train together indoors once winter hits. We also plan to provide some unique and fun content together with Wahoo."